View full sizeGus Chan / The Plain DealerCraps, poker, blackjack, roulette and more, Jill Vangen is ready to teach Northeast Ohio how to deal. Mayfield Heights native Jill Vangen took a vacation to Las Vegas three decades ago and fell in love with the town, the casinos, the excitement. She moved there and became a casino dealer, working first at the Golden Nugget and then the Mirage. 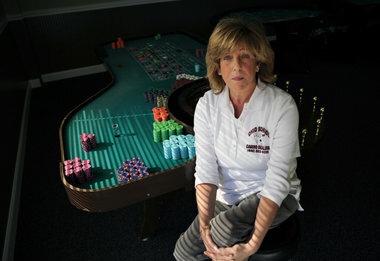 When voters approved casinos in Ohio, she decided to come home and help start a dealer school, one that could supply Ohio's casinos with employees. This fall, Vangen and partner Sonny Moss opened the Ohio School of Casino Dealers in Warrensville Heights. Recently, she answered a few questions from PDQ's John Campanelli. They can make anywhere from $35,000 to $100,000, depending on where you're at, how many games you deal. ... The more games you know, the more money you make. What makes a good dealer? Being able to deal the game proficiently and still be able to interact with the players. The players are there on vacation, or they're there to have fun, so you have to have a certain interaction. You have to entice players, have conversations. So half of your brain is talking with them about work, life, sports, whatever, and half is concentrating on the game? Do you have to love gambling to be a dealer? No. There are a lot of people who can't stand to play but who love dealing. You need to be able to add one and one. It's repetition. Craps is a bit more difficult. . . . Some games are more difficult than others. What's the hardest game to deal? Craps, because there's a lot of different variety of play, and you can have 16 players at one table and not one player will play the same way. Blackjack. There are only two payouts. You're not under any pressure at all. Any mistake can be corrected. As long as you don't steal money, you don't have anything to worry about. What's the most someone has lost at a table where you've been dealing? Millions. I'll say over $60 million. If I give you the exact figure, everyone at work will know who it is. Was that on a single hand or over a period of time? It was over the course of one night. Was he crying at the end of the night? No. It didn't affect him. It was like you or me taking $60 out of our pocket. It had no effect on him whatsoever. The best part of being a dealer? You know what the coolest thing is? I think the casino is the only place on the planet where it doesn't matter what your culture is, whether you're black, whether you're Chinese, whether you're Jewish or Russian. Everybody is just so focused on that same goal that you just don't notice. It's a great environment for working. How do dealers handle card counters? The casinos have automatic shufflers now. There are continuous shufflers, and the cards are all dealt face up. Single deck is one, two or three hands and then shuffle, so they pretty much don't have that problem anymore like they used to. As far as cheating goes, it's part of the dealer's responsibility to ensure that each player does what they're supposed to do and to be aware of any hand movements. That's one of the courses that we teach for each game. We teach game protection, and I'm licensed to teach collusion. What's the worst part of being a dealer? I don't think there is a downside. I don't think I've ever been unhappy or miserable. It's excitement every day when you go to work. You never know what's going to walk up. Should people take a class if they just want to improve their gambling skills? No. We don't teach people how to gamble. We teach people everything that's going on behind the tables. . . . If you're a player, what do you care if he has to use his right hand, not his left hand, going to rack? Some people think the casinos will hurt society. What do you say to them? It's going to enhance it. It's going to affect tourism and all the good things downtown, all the football games, the baseball games. It's really going to help tourism here. How do dealers stay focused? They work one hour on and then get a 20-minute break. So after six rounds and six 20-minute breaks, you're out the door. What do dealers do during those 20-minute breaks? They have a break room. They have a dining room. They go out to smoke. For information about the Ohio School of Casino Dealers, which is at Richmond and Emery roads in Warrensville Heights, go to ohioschoolofcasinodealers.com or call 216-464-DEAL (3325).
? 2010 cleveland.com. All rights reserved.